Since I began shredding the pounds, I have become keenly aware of not only my calorie intake but also my cholesterol intake. When I created my Kellogg's Honey Hazelnut Raisin Bran Muffins', back in April, I was not thinking of the sugar nor the cholesterol content in them. Sure, you can say, "Well it's only one egg", and "So, what is a couple of tablespoons of sugar". However, if you are eating these muffins as a part of your reduction breakfast on a regular basis , the cholesterol content of the eggs and the sugar will gradually become higher over time. 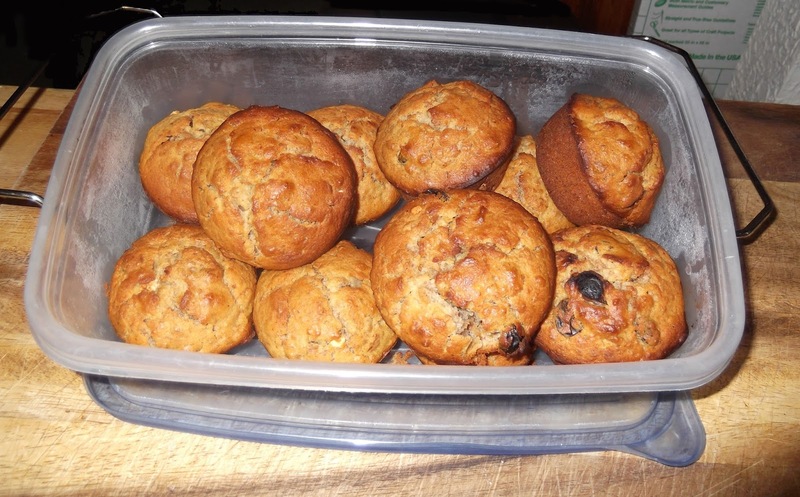 So not to bore you with a lot of dietary talk, below is my tasty new Low-Cal, No Cholesterol Kellogg's Honey Raisin Bran Muffins recipe. I guarantee that you will find that it is just as delicious as my first recipe. 1. Stir together flour, hazelnut meal, baking powder, salt and sugar. Set aside. 2. In a large mixing bowl, combine Kellogg's Raisin Bran cereal, raisins, milk and honey. Let stand 3 minutes or until cereal softens. 3. Add egg whites and oil. Beat well. For this you can beat the mixture with your electric beater and a single whisk attachment on low for two minutes. Avoid mashing the raisins. 4. Add flour mixture, stirring by hand only until combined. 5. Add an even portion of the batter into two standard muffin pans coated with cooking spray. 6. Bake at 400° F for 20 - 25 minutes. Serve warm. As a bonus, below is my low-cal breakfast menu for these muffins. The calorie count for each muffins is about 237. The calorie count for the meal is 364.